Ninety minutes were lost this morning removing the TV cabinet. The problem was caused by the “draw wire” between the TV cabinet and the display cabinet accidentally being pulled out some time in the last few days. 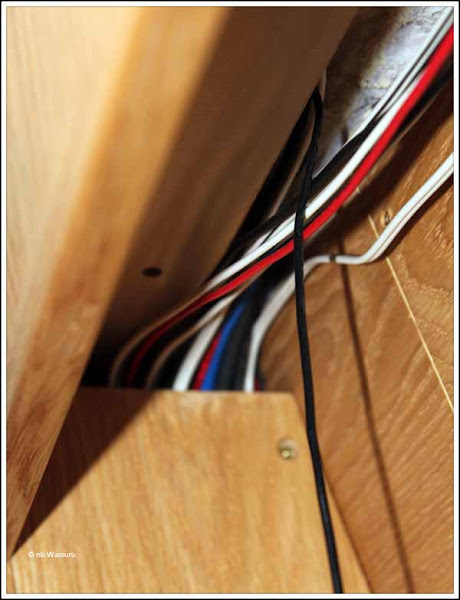 The wire runs in a plastic conduit fitted between in the cavity between the roof and the ceiling lining. I couldn’t get the wire back into the conduit without pulling down some of the ceiling lining. And the new TV cabinet was in the way. As a consequence Richard and I had to dismantle the cabinet. I’ve now threaded a timber block onto each end of the replacement wire which I hope makes it extremely difficult to accidentally pull out of the conduit. You can see all the cables have now been routed in the void between the inner and outer cabinet wall partitions. At my request Richard has made an access hatch on the inner wall of the cabinet. It’s inside the TV compartment so will be out of sight. I wanted the hatch in case we need to install some additional wires at a later date. All the wires are accessible, but out of sight. 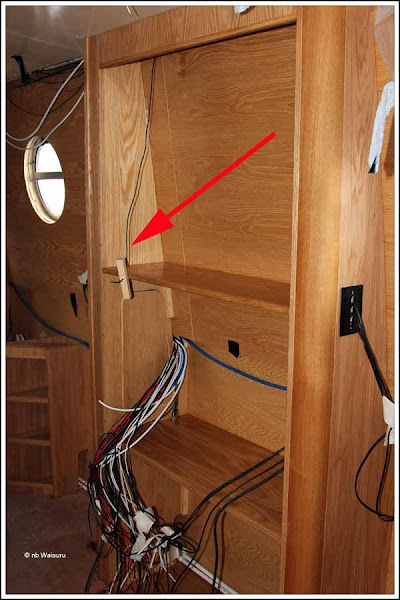 Before he left, Richard measured the upper compartment for the glass shelving and sliding doors. After everyone had left for the day I took the opportunity to clean the cabinet and give it a first coat of varnish. Apparently the courier from Amazon attempted to deliver the TV swivel bracket to the boatyard at 9:00PM last Friday night. The boatyard was well closed by then! Apparently the courier left a delivery card in the letterbox. The only problem is… the boatyard doesn’t have a letterbox? One missing bracket!!!! This morning Jan measured length and width of the bed as she intends to order the mattress very shortly. Tomorrow Richard will be rebating the galley cupboards and drawers so the flush handles can be fitted. James will continue making the second bedside cabinet. Local launderette offered the service at a reasonable price. I'll say it strange. Even worse.... we were told the courier was making a second attempt to deliver today. It hadn't arrived by 5:00PM so I waited at the marina gate until 9:00PM without any success. Needless to say I'm now somewhat annoyed!